Do you ever feel a pang of envy? Envy of others who have more time to write than you? I’m envious. I’m envious of the people who are healthy and who can work full time. I imagine them having an abundance of time to write. But I don’t feel envious of a specific person. Because deep in my heart, I know that most of us juggle too many commitments. We fight our own demons. We face our constraints. And really, when I think about it, who writes as much as they’d like? Don’t we all want to write more? The book “A Beautiful Constraint” is a handbook for inventiveness. Its authors, Adam Morgan and Mark Barden, show how organizations use constraints to kindle creativity and to innovate. Wow. I thought. What a simple way to stop blocking our creativity and to force us to think deeper. Could I apply the same thinking to personal constraints like time and energy? I’ll never finish this anyway, so why work on it? Such reasons block our creativity. They prevent us from looking for solutions. 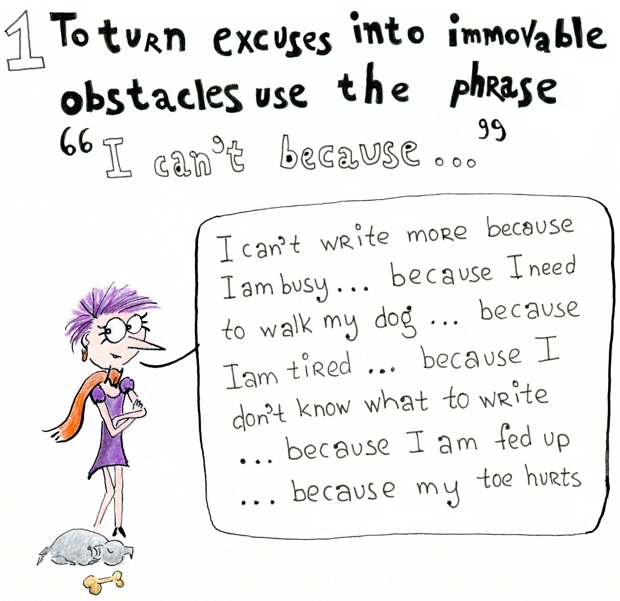 They can turn the flakiest excuses into immovable obstacles. I can’t. I can’t. I can’t. It won’t work. Do you recognize that negative loop, too? The “We can if …” question invites us to explore new possibilities. Of course, we can’t wave a magic wand and give ourselves two extra hours for writing each day. But we can look at our schedule and find small pockets of time to write more. We can manage our limited energy a little better. We can ban distractions, and improve our focus and productivity. “I can if …” encourages us to work around our constraints, to look for the things we can control and find ways to do what we desperately want to do. “I can’t because …,” in contrast, gives us permission to stop looking for solutions, and it allows us to keep fretting. The challenges that these people were set seemed impossible. A table for 5 euro? Almost 100% college acceptance? How do people solve such seemingly impossible problems? Victims and transformers aren’t two types of people. Everyone can move between the two mindsets. For instance, my general approach to writing is a transformer mindset. But when my writing habit is interrupted, for instance by a health setback, then I can fall back to the victim mindset. I only see blocks. I feel overwhelmed. Everything feels too difficult and I can’t see a way out. We feel we’ve been dealt a bad card, so it’s not our fault we’re not writing as much as we want. We might look at others and imagine how easy writing is for them. But do we really know what struggles they’ve been through? Does this comparison only entrench our victim mindset? So, how can we shift our mindset? A belief in the possibility that you can find a way to write more. What if you could look for small pockets of time? What if you could train yourself to focus better? The motivation to find energy, focus and time to write more. Why do you want to write more? Which ideas do you want to spread? What’s the book inside you? What difference could writing make to you? Is writing really a priority for you right now? And what are you prepared to give up so you can write more? Recent research has suggested we don’t have a limited resource of willpower. But when we think we lack willpower, we lose our self-control and our willingness to get things done. Telling ourselves we lack willpower might be another way to reinforce our victim mindset. So, instead of worrying about lack of willpower, connect with your “Why.” Believe in yourself and nurture the habits to write more. Is an inner voice whispering you’d love to write more? But does a much louder voice tell you it’s impossible because … ? You can choose which voice you want to listen to. You’ll be amazed how much more you can write, when you carve a little extra space in your diary for writing. It’s true. We do what we believe we can do. If we’re stuck, it’s because we think we are. At least that is what’s at the bottom of it. I like the way you’ve named the two mindsets we writers shift between. This post should help any writer find the transformer mindset whenever she needs it. The names of the two mindsets come from the book by Morgan and Barden. I found the idea we could shift between these mindsets an eye-opener! Thank you, Julie. Happy writing! I have made up my mind that if I’m ever going to become a good writer, without spending a fortune on courses, I need to study your posts as if I’m reading for a college degree. I think that will be enough to turn me to the kind of writer I dreamed to be. Happy writing, Eben, and thank you for stopping by. Great to read ! This post, All your posts are like seeing a bright light from shining Sun! Have yourself a Wonderful Day! Thank you, Rahul. Happy writing! Thank you, Henneke. This is a brilliant and simple (and brilliantly simple) way for us to transform our internal conversation. You’re fabulous! When I read about this idea in “A Beautiful Constraint” it seemed so brilliantly simple to me, too. And if they can apply it to conversations in organizations, why can’t we apply it to our own internal conversations? Happy writing, Rachel, and thank you for your comment. Great article, and thanks for the book recommendation! Love this! Wonderful writing and thinking and ideas. Ok, so here is a question for you. What is the difference between willingness and will power? P.S. I am sorry to hear about your health setback. May you find not only comfort, also regain vitality soon. Willingness is wanting to do something. 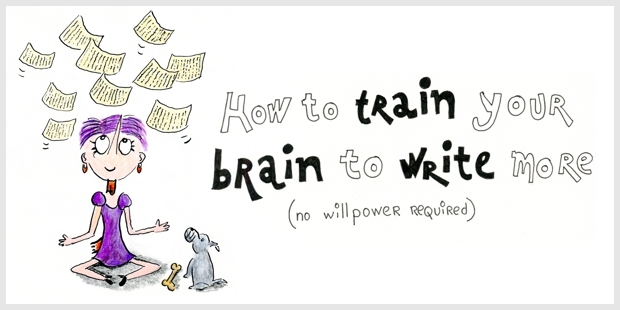 Willpower goes further, it’s being able to delay gratification (like eating chocolate or having fun on Twitter) so you can achieve your long term goals (like losing weight or writing more). So, it’s more about self-control and discipline. Psychologists used to say we have a limited amount of willpower, so we have to use it wisely, but recent research has suggested this isn’t true. Interesting read! Being the pessimist I am, my victim mindset dominates over my transformer mindset naturally. This article is a dose of freshness and I think from this day forward I’m going to pay more attention to my transformer side! Great article .. again 😉 thanks, Henneke. Wow! Such a seemingly simple yet brilliant idea! And with potentially far-reaching results. Thinking about this, I realise I tell myself way too often that “I can’t because…” story. The exact words vary, but that’s what I do. I can write more IF I plan for it. I can make a plan IF … (I’ll fill in those blanks this afternoon). I love it when someone immediately applies the ideas in a post! When I read this concept, I did the same. Let me know how it works for you? Simple and brilliant! Love this! The concept is something everyone “knows” but the simple actionable application is awesome. You always light up my day. This is a great post and reminded me of a journaling technique (called “sentence stems”) I learned from a client about 8 years ago. Essentially you do the same thing “I could be more productive if…” and write 6-10 endings to the sentence stem (don’t think and don’t look back—just write). You do it every day for a week or two. Then go back through your answers. You’ll see related ideas you can group together. Pick out the best most actionable ideas you’ve come up with and prioritize them. Toss the rest. I’ve used that technique many times in the past and it’s amazing how creative I am 😉 Anyway… Great post. Thanks again. I love that idea. I might try it! Thank you so much for sharing, Chuck. Henneke – I’ve recently been rereading portions of Steven Pressfield’s The War of Art. He talks about that voice you speak of here and labels it Resistance. When I have doubts about getting to work writing, as I did this morning, I remind myself that that voice is not me. It’s Resistance. It seems to give me the strength to not go there (doing whatever) to avoid doing what I know I should and want to be doing. 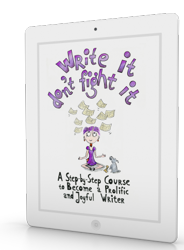 I agree with you that resistance (or our inner critic) is often a big reason why we don’t write as much as we’d like. As writers, it’s so important to be able to diagnose our own stuckness, and then find tactics to write on. I read The War of Art years ago, and at that time, it didn’t really resonate with me. Perhaps it’s time to re-read for me, too! Thank you for mentioning it. Encouraging article for those who find it difficult to write. Excellent! But really, my brain doesn’t do the writing; I do. The brain just helps me hit the right keys on the keyboard. That’s a really interesting point and it’s a bit outside my comfort zone. But as far as I understand, our brains do the thinking and direct our fingers to keep moving. And as for the “self”—do we really know what the “self” is? I don’t think scientists have been able to pinpoint the “self” yet. Could be a fascinating discussion … but I’m no expert! Great post Henneke– I need to buy this book (well I just ordered it!) and get everyone one of my clients to read it . . . and read it myself. Looking forward to reading it. It’s a great book. I hope you’ll enjoy it! Love this article. Beyond writing more, it can be applied to any ambition. Yep, in the book “A Beautiful Constraint,” this idea was applied to other ambitions beyond writing, too. I can if… is indeed a smart way to help yourself think again! It will work in many areas. I like how it changes the (internal) conversation from blocks to possibilities. Thank you, Henneke, for this article. I NEVER leave comments on blog posts, but I feel compelled to with this one. The idea is simple but so enlightening. It had quite an impact on me. I feel more positive and empowered to stop the excuses. Thank you, Henneke. I always get inspiration to move on with my writing whenever I read your post. It pushes me onward. So well said, as you always do. Yes, every action begins with a thought. Thanks, Henneke for reminding me. Yes, every action begins with a thought. And a thought is just a thought, so we can change it. Thank you for stopping by, Cay! By any chance are you a mind reader? This post certainly resonated with me today, not least because my big toe is hurting (I am waiting for surgery). I love the idea of “I can if” and I’m going to try this right away. But I didn’t know about your big toe, and I’m sorry to hear it’s hurting. I hope you get well soon, Sue! Very inspiring. Not only in writing, but in solving Big Hairy Life Issues as well, I find. As a life coach, I feel the “I can X, if Y” approach will benefit my clients and myself as well. Thanks for the beautiful insight. Excellent article Henneke, I love anything to do with mindset. And I ADORE your drawings. Isn’t it magical what you can create with a vision and a willingness to learn? Good on you for persevering. You can put yourself up there with the best now. ♡ Woohoo you! Isn’t mindset fascinating? It’s only in recent years that I’ve realized how much my thoughts influence my actions and my life. Thank you for your lovely comment, Joan. I’m good at thinking far too much, too! The “I will” suggestion is interesting. It feels to me, that we may need them both. First, “I can if …” to explore options. Then once an option is decided, “I will …” helps make a firm commitment—when I’ll do what. What do you think? Thank you for stopping by again, Curtis. 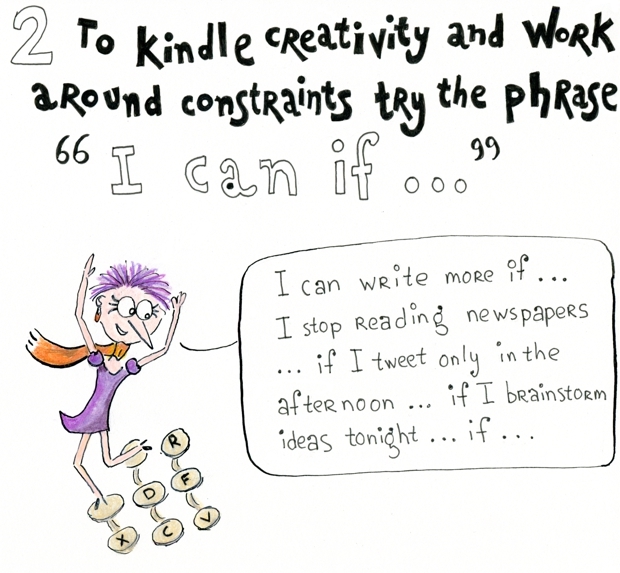 Constraints have long been my building blocks for creativity. As a mindset/creative life and biz coach it’s great learning of the the book AND I love how you’ve applied it. So cool! Thank you. I had used constraints in creativity before. For instance, instead of thinking about just any metaphor, I might try to think of a cooking-related metaphor. But I’d not thought about constraints in the sense of designing my life before; that’s such an interesting approach. I’ve discovered that enacting constraint is the best way to navigate many situations, especially difficult ones. Living on the edge of wilderness for the at 25 years has meant I got to practice and hone the ‘art of constraint’. What a cool experience. I am also primary support for my health constrained partner. Knowing how to build a life by leaning into constraint as opposed to pushing against it has been a godsend. I can’t wait to read A Beautiful Constraint. I like your idea of leaning into constraint. Thank you for sharing. Yes, I’ve read that one a few years ago. It’s an excellent recommendation, too. Interesting post and look on training the brain. The idea of using “I can if” to find motivators seems like it just might work! I am amazed with your ability to inspire. This quite possibly your best post. That’s a big compliment. Thank you, Eugene. This article is very apt for writing and also for improving our mindset and expanding our vision. Thank you, Ashoka. Happy writing! Henneke, thank you for the great insight! I sometimes (when pressed for time to get things done), find myself shifting between these two mindsets and can see how easily it can be done. From this day forward, I’ll definitely be more mindful and choose the transforming side as much as possible. Observing the two mindsets in myself was very interesting. Thank you for stopping by, Sonya. Happy writing! The mindset shift could help out so many people stuck at the moment. Should I scrap my first blog post? Would subscribers open my newsletter? Should I tweet this or not? That’s something a lot of people are thinking right now, even right this moment. I know this because I have been there; last year I took a step of publishing my first eBook — the only reason stopping me was that I thought I’m not good enough. Then I thought, “so what?” and I did it. It taught me so much. Now I’m confident to publish my second eBook. Surprisingly, that initiative helped me gather self-belief to write a novel, which I have in mind. I know it sounds “Woah,” but when I emailed to a friend in the UK who is a published novelist; she said, “just put it out there” and I know somewhere deep down I have a thought that I would pull it off this year. Honestly, I can’t express how I felt after reading this post. It’s indeed super rich and inspirational. It’s really funny how we often hold ourselves back from achieving greatness. It’s funny how with just our mind, we creates roadblocks for ourselves and later assume we’re just unlucky. Similarly, in one book I read some time ago, the author suggested that instead of always saying that something is impossible, you should rather ask yourself, “how can I make this to work”? According to him, when you say that something is impossible, you’ve already made your mind dormant and unable to think for a solution, but if you ask yourself how you can make that same thing to be possible, you’re mind will start working immediately to find a solution. And that is exactly what you just explained here, and I couldn’t have agreed more. This does not only apply to writing, but also in every aspects of life and business. I believe that if one can really apply all the tips you shared here diligently, he’ll be able to always turn things around for himself and achieve whatever it is he want. Thanks a lot for sharing Henneke. I agree with you that we often hold ourselves back from reaching our potential. It happens to me all the time, too. It’s so easy to block ourselves, find excuses, and give in to our fears. Thank you so much for stopping by, Anil. I appreciate it. I’m looking forward to reading A Beautiful Constraint. I intend to apply this concept to everything; writing AND life. She sent me a “kudos” but I really had no idea how I was going to go about it. However, although I am late to arrive here and read, I now know exactly how it will go. It sounds like it may be time to drop some “priorities” from your list? I know it sounds as if I need to drop some priorities, but maybe I’ll only drop them to the bottom of the list for a while. Rising to the challenge of finishing an update on my blogsite, as I’ve been invited to link to a state-wide blogsite in my niche. Also, a new granddaughter is imminent, and I’ve promised to be available for a few days after her birth. I think I’ve noticed another good use for the contents of this post, though. There are times when people approach me with grand ideas I do not think they want badly enough to work for. I don’t want to squelch their enthusiasm, but do want them to realize the cost in advance. Saying, “We can do that if…” is far more cheery and hope-giving than saying, “We cannot do that because…” If they come up with the “if” then good! And if not, then it was not I who made the idea fail. I’m pretty sure this grand post would help with children, too, who want a lot of things they later do not appreciate. I am seeing this entire idea from many sides, and it’s all good! And I know, I can never really be too late. You always reply to my comments, no matter how long it takes me to get here, only one of the many reasons I keep coming back. Thanks! How did you know my big toe hurts? I hope your big toe feels better soon! This is the exact problem I was facing. I have many unpublished articles on my website of granite countertops. Just due to the lazy ness. Thanks for sharing the idea of writing more. Great tips there Henneke. In life we can achieve what we want, writing too is not an exception. Just need to change your thoughts and grow your willpower. I’m not sure we can always achieve what we want, but it’s true that we can often achieve more than we think. Thank you for stopping by, James. I appreciate it. I want to write bang on offers to get people to sign into my optin form on my website. Should I start a personal blog to start an email list? A blog can be a great way to increase traffic and increase your credibility, but it’s not a quick fix (unless you have an advertising budget). I don’t have much furniture, but I need to clear out at least half if not 3/4’s of the “stuff” in my house and make it GO AWAY, so I can call in a realtor and put my house up for sale. But I’m totally OVERWHELMED and don’t know where to start, so I DON’T START. But I just tried your trick and said to myself, “I can organize, vacuum and mop the laundry room and the broom closet in 20 minutes.” I did it! “Tomorrow I can clear off a catch-all table, vacuum & mop the kitchen in 20 minutes.” Then I can write for 30 minutes. Thanks for this great tip! It’s like eating an elephant–a bite at a time! Good luck with clearing out and selling your house, Diane. And thank you for taking the time to stop by. I appreciate it!